Antichamber is weird. Most reviews use words such as “non-Euclidean” and “Escher-like” to describe it. Watching the trailer evokes memories of Portal, but with the brightness and contrast turned way up, and the portal gun replaced with a different, slightly more colorful sidearm. After the nearly two-minute-long trailer, confusion sets in. Nothing seems to make sense. Floors disappear and reappear, walls appear where there were none, and staircases lead back to the entrance of the same room — all while you are running through stark-white corridors. It looks challenging, and not solely because the game appears to make no physical sense. It also challenges the player psychologically, urging them in ways one might normally expect and — more often than not — in ways many would never believe possible. To quote Venture Beat, “Every aspect of Antichamber is made to get players out of their comfort zone.” Needless to say, I had to play it. Then the game changes, and things previously understood must be completely restructured. Perhaps you stumbled upon a new room, or a new way to solve something you previously thought impossible — or you discovered a new mechanism you did not know existed. And this does not happen just once. 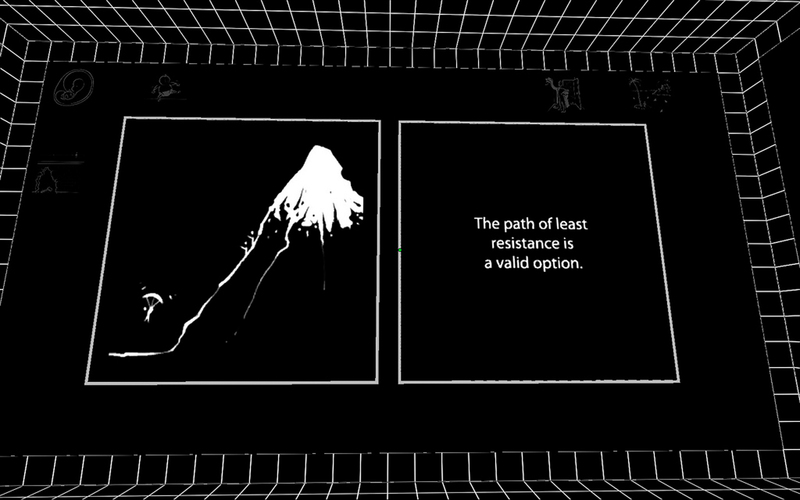 It is clear that Alexander Bruce, the sole developer of Antichamber, knew what he was doing. Antichamber never stops. In some games, when I get stuck on a puzzle, I’ll put down the controller, and come back to the game in a few days, a week — sometimes months. However, when you fail a puzzle in Antichamber, you don’t go back to the beginning of the challenge. Instead, you wind up somewhere completely unexpected, with an entirely different challenge ahead of you. Perhaps you can’t solve that puzzle. That’s okay; there’s another one waiting just beyond. If for some reason the player gets completely stuck, Bruce discourages using a walkthrough. “You only get to experience the puzzles once,” he said in an interview with Ars Technica. “Take a break instead.” Combining that with the perfectly non-Euclidean world (where the laws of physics as we know them do not apply, and the expected should always be unexpected) and the wonderfully Escher-like corridors (where two lefts do not make a right, and three ups can make a down), you are treated to mind-melting, beautifully perplexing puzzles. Bruce has made Antichamber as good as it can possibly be — and rightly so, since this project took almost four years to complete. It is simple, yet almost nauseatingly complex. It is an adventure, both through the impossible hallways of the game and through your own psyche. It is clever, intelligent, and unmistakably beautiful. I hope to always be able to be that kid in the tree, and hopefully this level of quality and inventiveness continues to grow in the game-making community.